Demolition is antithetical to construction, yet the two certainly function together well. To construct on existing structures, it is often necessary to destruct, intentionally removing or damaging building components for the purpose of erecting something anew. However, the disassembly of complete building and structures inherently presents an assortment of hazards. For preventing harm in demolition operations, ANSI/ASSE A10.6-2006 (R2016): Safety and Health Program Requirements for Demolition Operations offers guidance. 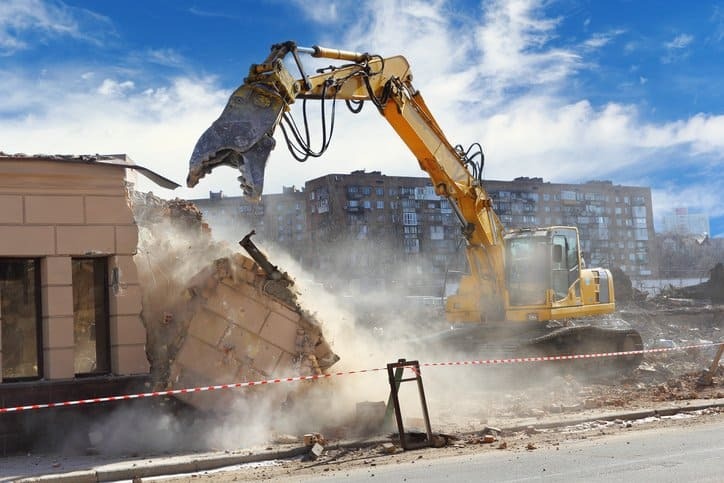 As demolition is essentially just construction in reverse, it creates additional hazards that result from different and sometimes unknown factors. These can include changes from the structure’s design that were introduced during construction, modifications that have altered the original design, materials hidden within the structural members (lead, asbestos, silica, and other chemical or heavy metals that require special material handling), unknown strengths or weaknesses of construction materials, and even hazards that may emerge from the demolition methods used. Demolition can be unpredictable, so ANSI/ASSE A10.6-2006 (R2016) provides guidelines that help to protect and safeguard the public and employees from demolition operations and prevent damage to property during these activities. The standard details many guidelines for preparatory operations, such as making a written engineering survey of the structure by a qualified person, catch platforms and scaffolding, warning devices (in accordance with ANSI Z535.1, fire protection, facilities arrangement, storage, and the removal of walls, steel, and other materials and components found in buildings. ANSI/ASSE A10.6-2006 (R2016) is an American National Standard developed and published by the American Society of Safety Engineers (ASSE), an ANSI-accredited standards developing organization whose standards focus on protecting people, property, and the environment. The ANSI/ASSE A10.6-2006 (R2016) standard is also one in an extensive series of standards formulated by the Accredited Standards Committee on Safety in Construction and Demolition Operations, A10. Standards in the A10 series have major application in industry, serving as a guide to contractors, labor and equipment manufacturers. ANSI/ASSE A10 standards cover scaffolding safety, temporary construction elevator safety, personnel hoists on construction sites, sanitation in construction, and many other relevant and important subjects. ANSI/ASSE A10.6-2006 (R2016): Safety and Health Program Requirements for Demolition Operations is available on the ANSI Webstore.